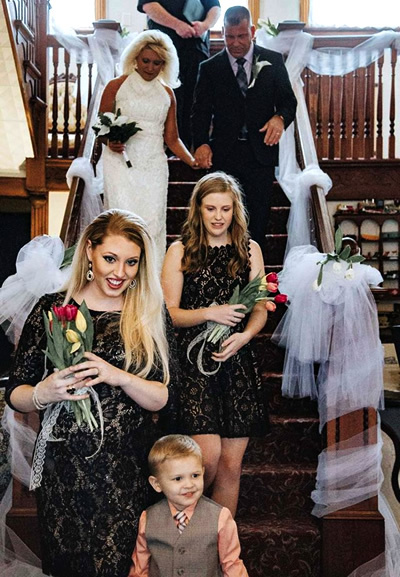 We offer several property locations to choose from for your wedding at Grand Victorian Inn. Indoor entrance for an intimate gathering on up to 55 in the dining area. Outdoors provides four location options; the front door with chairs in the grassy areas on either side of the grand entrance; the side staircase with chairs in the driveway, buffet tables, etc. ; the pergola walkway to the wedding pergola with doors that open for the surprise for the guests and groom, walking on a brick path; the rear of the property overlooks rolling hills with lush green pastures and occasionally black Angus, with the chairs in the grass. Many accessories to choose from, whiskey barrels, old suitcases, pedestals, draperies, flowers, and plates, silverware, cups, punch bowl, linens, lace, 40 white wooden chairs, 8 plus tables…and other cute items to make your day special and a wonderful memory to be cherished forever.